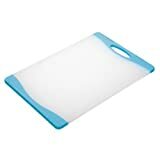 So I’ve been trying to expand my list of recipes which take 30 minutes or less. As much as I love cooking I have so much to do in the evenings that if I can be sitting down to dinner before half seven I count it as a significant win. This baked feta is the epitome of a quick dinner. 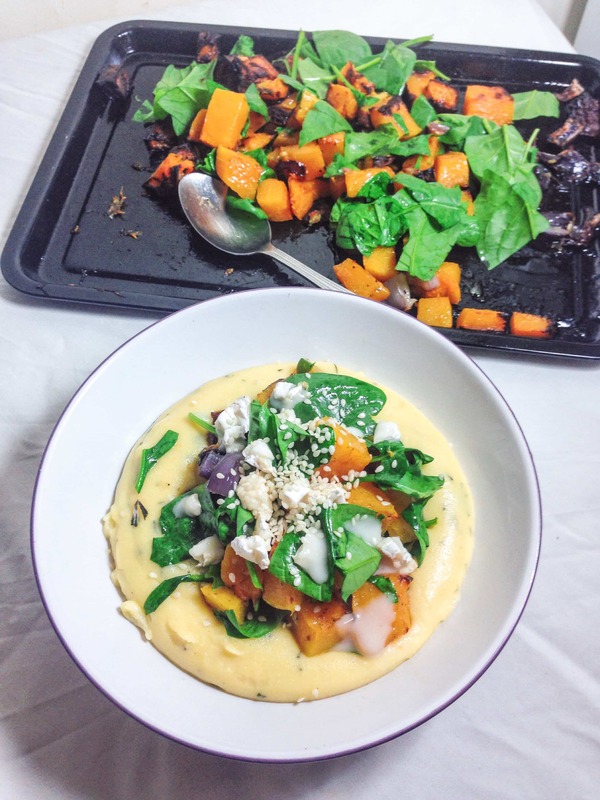 Throw a few fresh ingredients into a baking dish, top with a block of feta and bake until browned. And you’re done! Now don’t get me wrong, I have quite a few recipes here on the blog that can be made super quickly. 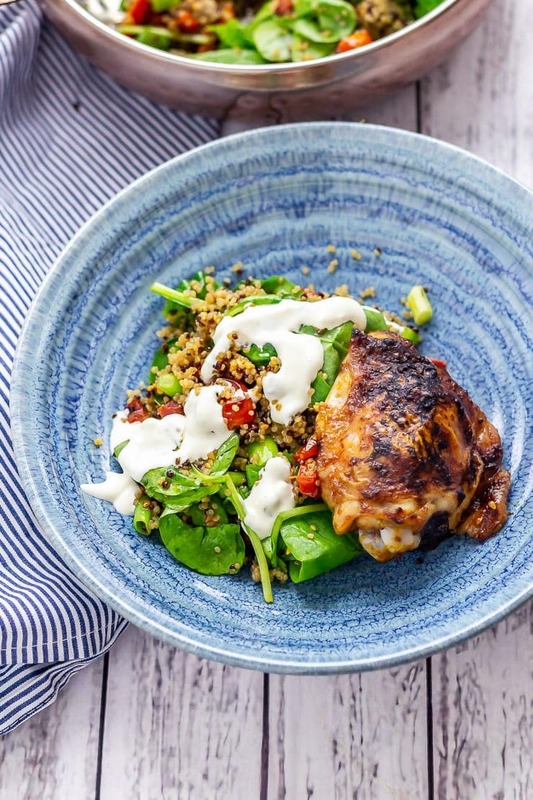 There’s a whole category for quick and easy recipes and some of my favourites include these 15 minute salmon burgers and this spinach pesto with feta. Having said that I can always do with more ideas. Especially ones that are as hands off as this baked feta. It takes just a little bit of chopping and that’s it! 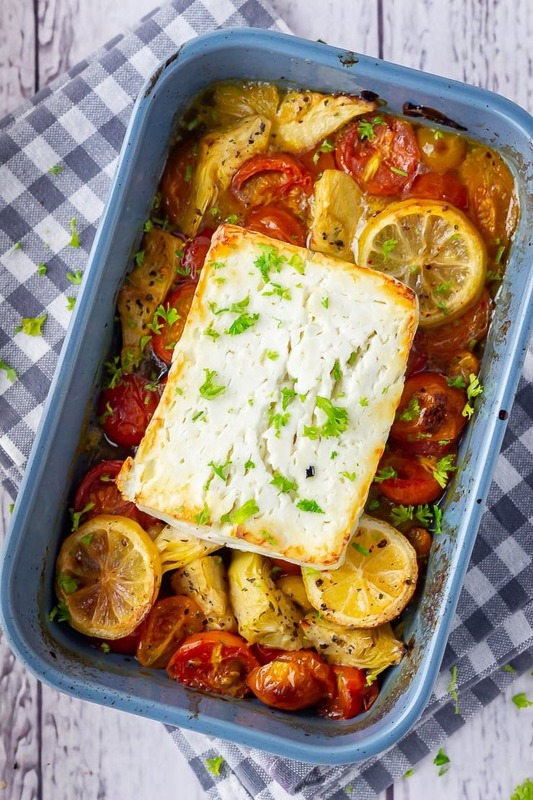 This baked feta recipe has the makings of my perfect dinner. First off, anything that belongs with bread belongs in my life. I love bread and my favourite meals involve plenty of it. In fact bread and dip could easily be my dinner and I’d be completely happy. 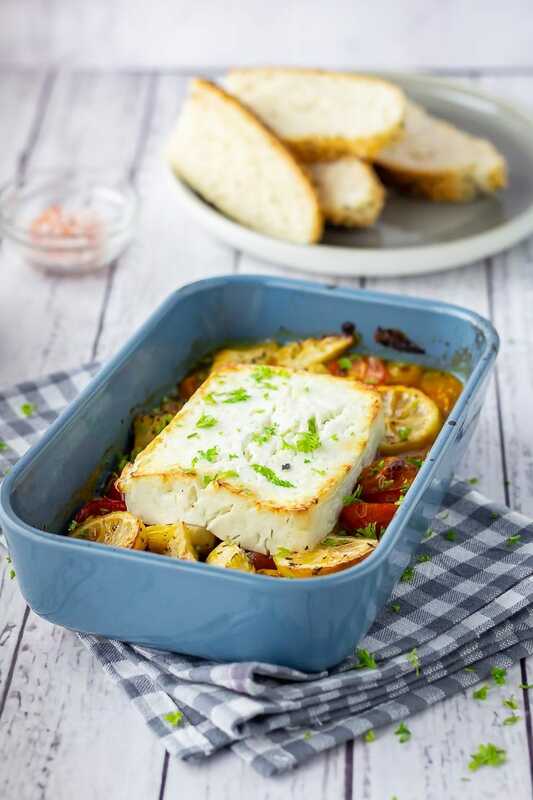 This baked feta has the combination of soft, warm cheese, roasty vegetables and most importantly all those cooking juices in the bottom of the dish. Those roasting juices + crusty bread = me crying over my dinner because it’s so delicious. Secondly its main component is a big block of cheese. Need I say more? If you’re not sure about feta then I would definitely encourage you to try it this way. 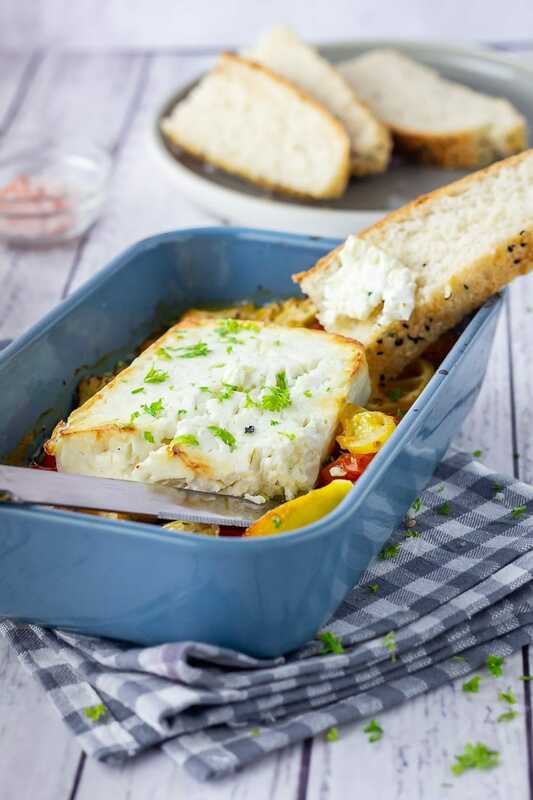 Even if you normally find the flavour of feta a bit much, baking it makes it so much milder. 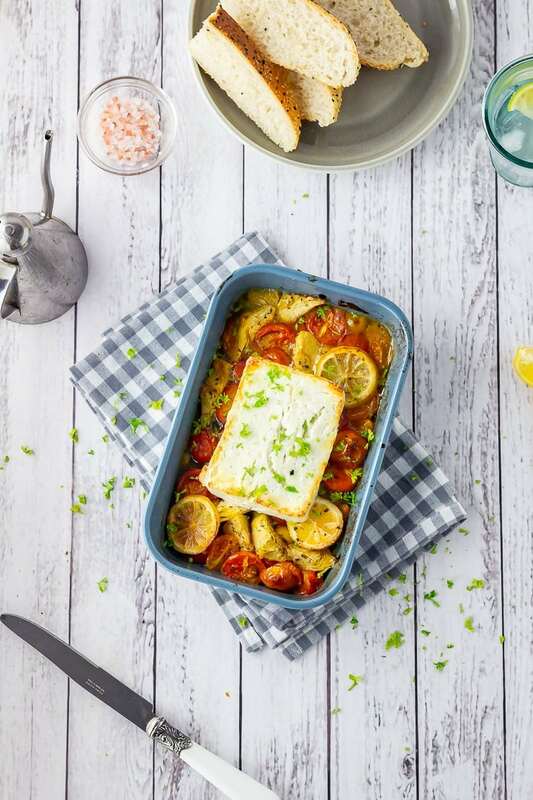 Heat the oven then place the tomatoes, artichokes, olive oil, chilli flakes, oregano, lemon juice and lemon slices in a baking dish and bake for 10 minutes. Take the dish out the oven and place the block of feta on top of the vegetables. Put under the grill for another 10 minutes. Serve topped with parsley and with some crusty bread. The reason feta is perfect for this dish is that it doesn’t melt. Instead it gets lovely and browned on the top and has an amazing soft texture which makes it perfect for spreading on slices of bread or even crackers. 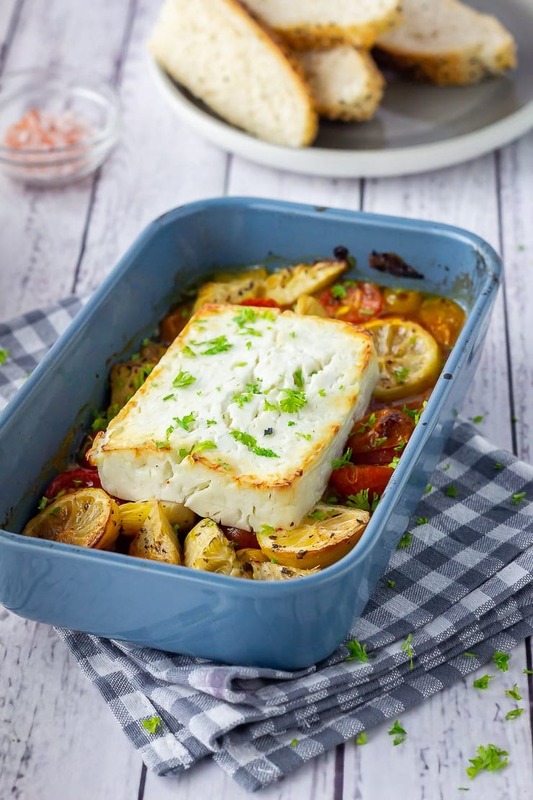 What to serve with baked feta? 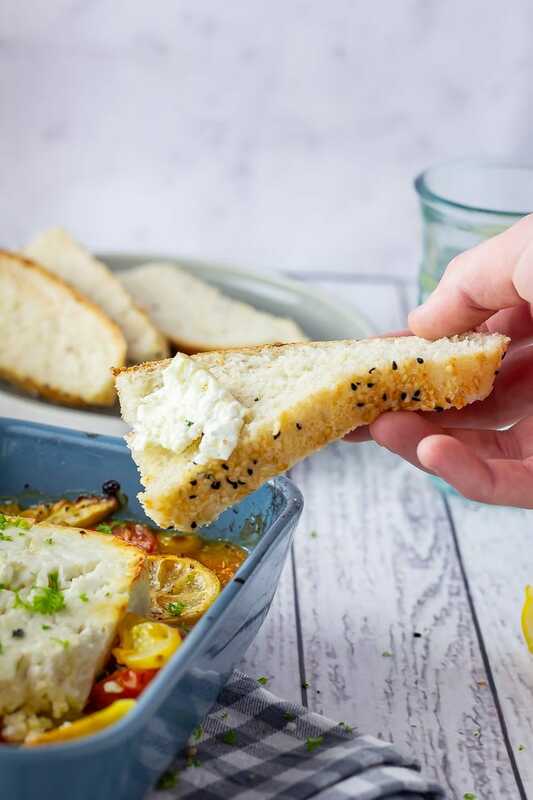 I like the baked feta simply served with some crusty bread but if you want more then you could add some rice or another grain. A big green salad would also be good. 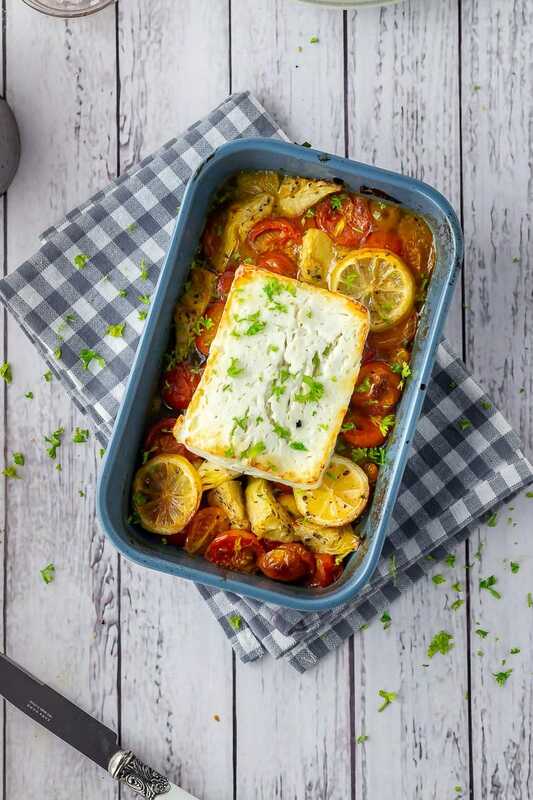 This baked feta uses beautiful fresh tomatoes which makes it the perfect thing to cook in summer but I want to make sure you can make this recipe all year round! Autumn: Try honey roasting some figs for 10 minutes instead of the tomatoes and then top with the feta and fall in love with that sweet and salty combo. Winter: Beetroot and feta are an amazing combination and beetroot is in season in the winter so try replacing the tomatoes and artichokes with it. Peel and chop the beetroot and roast it for half an hour before topping with the feta. Spring: How about some roasted red peppers and sweet potato? 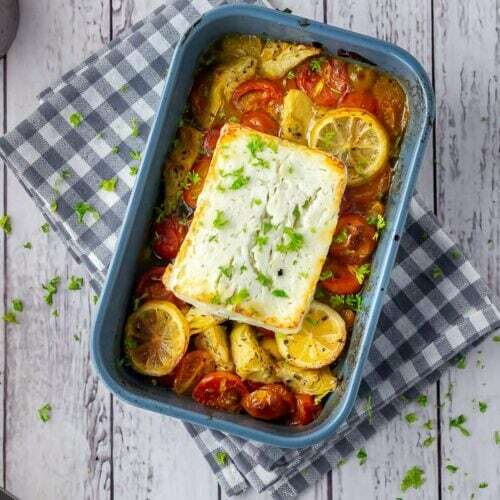 WONDERING WHAT TO DO WITH THE LEFTOVER INGREDIENTS YOU’VE GOT FROM MAKING THIS BAKED FETA WITH ARTICHOKES & TOMATOES? 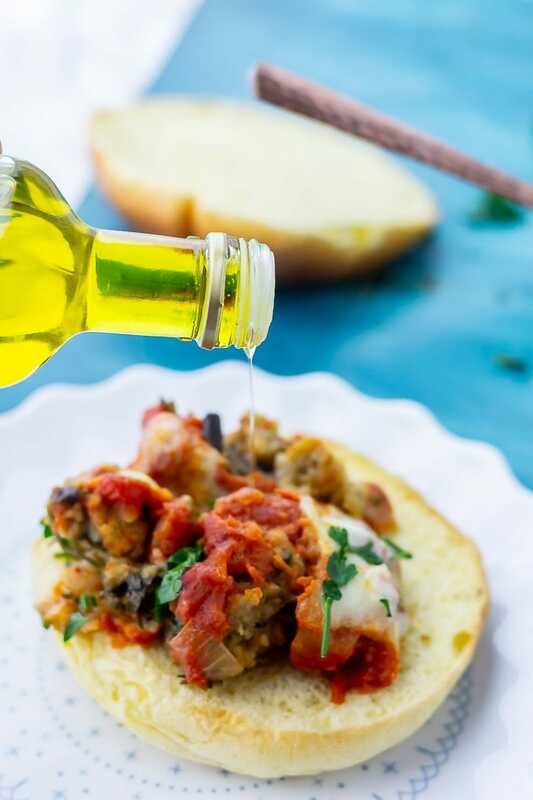 Use up parsley in these incredible vegetarian meatball sandwiches! Heat the oven to 200°C/400°F. Place the tomatoes, artichokes, olive oil, chilli flakes, oregano, a squeeze of lemon juice and a few slices of lemon in a small baking dish. Place in the oven for 10-15 minutes. Take the vegetables out of the oven and add the block of feta on top of the vegetables. Switch the oven to a medium high grill/broiler setting. 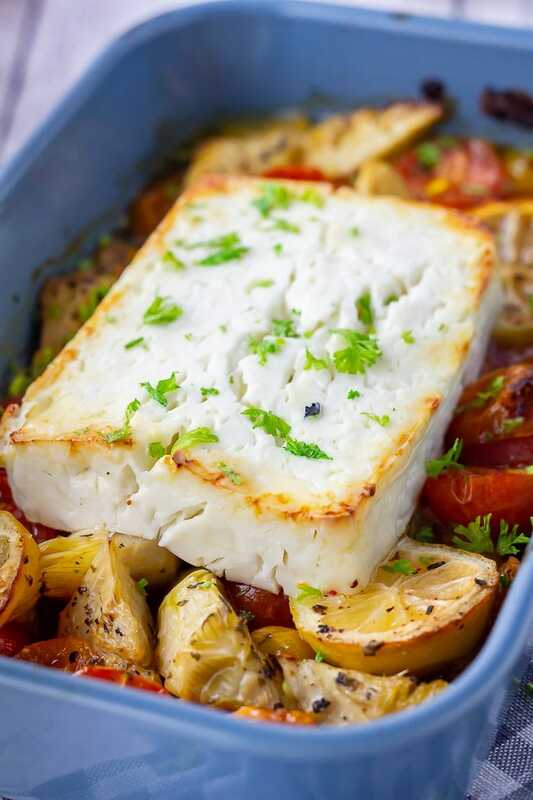 Place the baking dish under the the grill and cook for about 10 minutes keeping a close eye on it to make sure the feta doesn't burn. 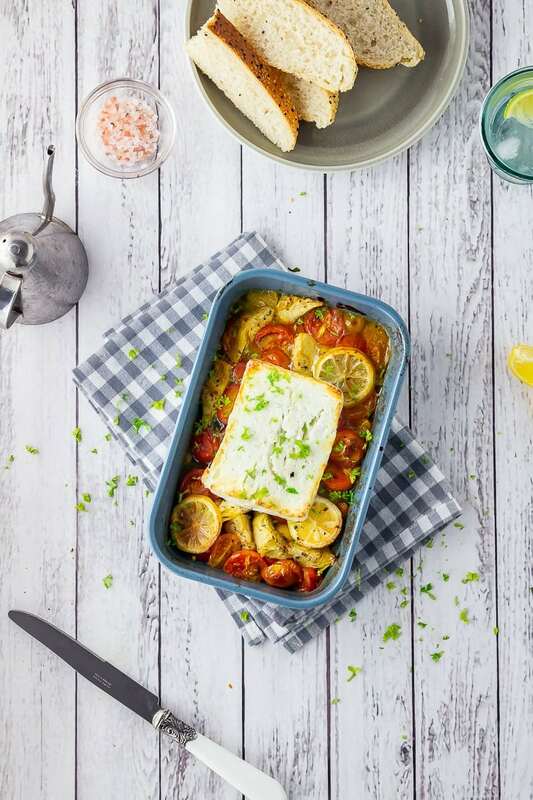 Serve the baked feta with a sprinkling of fresh parsley and some crusty bread. I could eat a whole loaf of bread and this every night for dinner. LOVE feta! This is the perfect party dish!! I can’t wait to make it! Oh yum!! Would it be bad if I just ate this entire thing for dinner?? Seriously all I need!! Feta AND artichokes!? These are two of my faves – can’t wait to try this amazing dish! 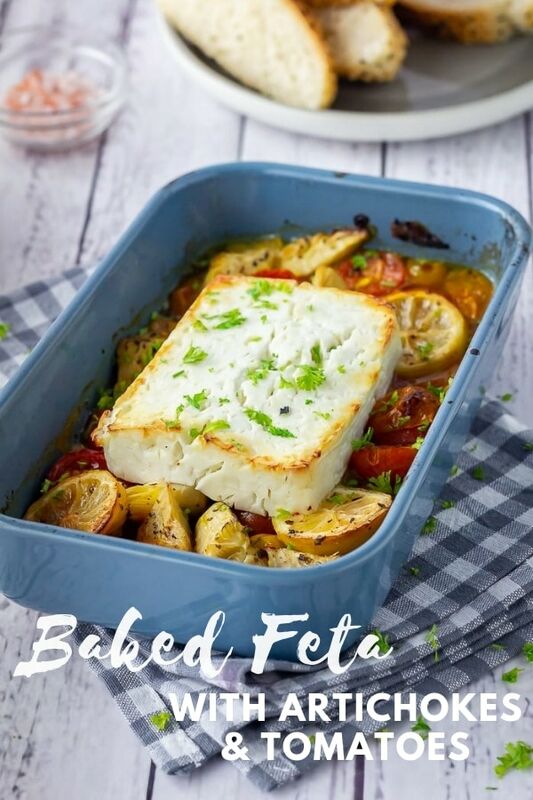 I’ve never had baked feta but this sounds SO yummy!